Install smoke detectors on every level of the home, and make sure at least on is located outside the sleeping area. If you decorate a real tree, water it everyday and prevent lights from coming into contact with tree branches. 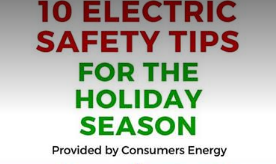 Turn off or unplug holiday lights when not in use. Never leave lights on unattended. Consider using a timer. Avoid running extension cords across long distances, under rugs, or near doorways. Never use extension cords with space heaters. Keep electrical connection off the ground and make sure wiring is clear of downspouts, railings, and aluminum siding. Always keep a working fire extinguisher in the house. If you choose an artificial tree, be sure it is certified as fire resistant by looking for the UL label. Use holiday lights that are approved by the nationally recognized testing organization such as UL. For outdoor decorating, use only lights and power strips that have been approved for outdoor use. Before hanging your holiday lights, inspect them for grayed wires, broken sockets, or other signs of wear and tear. Then test each light string.